Not a night goes by that I don’t have a cup of hot chamomile tea before bedtime. It’s one of nature’s oldest and most gentle sleep aids and not only promotes calmness but also soothes the stomach. The flavonoid in chamomile that promotes sleep is said to be apiginin. I select a tea that lists no other ingredient than chamomile because I prefer the taste. Valerian, which contains isovaleric acid, is also a safe and effective way to promote sleep, but it tends to have a bitter taste and an odd odor. Neither valerian nor chamomile has adverse effects on next day alertness; however, valerian in high doses may cause headaches, dizziness and nausea. Other ways to make the bedroom more pleasant include adding lavender sachets to the linen closet to scent the bed sheets and to make small sleep pillows of cheesecloth. These sleep pillows will fit inside the pillowcase with the regular pillow, and your body heat and head pressure will release essential oils, acting like aromatherapy. The most popular sleep pillows are filled with lavender blossoms which relax the body and the mind. 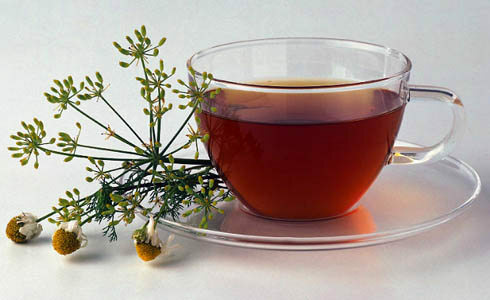 Other insomnia-relieving herbs include chamomile, hops cones, lemon balm leaves and rose petals. Any combination to equal about 3 cups can be used, and I like to add a tablespoon of orris root (the root of Iris germanica) as a fixative to stabilize the mixture. Two notes of caution: some people may be allergic to orris root and if hops are used, they should be replaced every three to four months because they may become rancid and cause headaches.